This morning I was asked to go with several mahouts to a nearby trekking camp in order to look at a new elephant that might be donated to ElephantsWorld. I was thrilled at the chance to be able document the process of acquiring a new elephant but the reality of the trekking camp overshadowed my excitement. 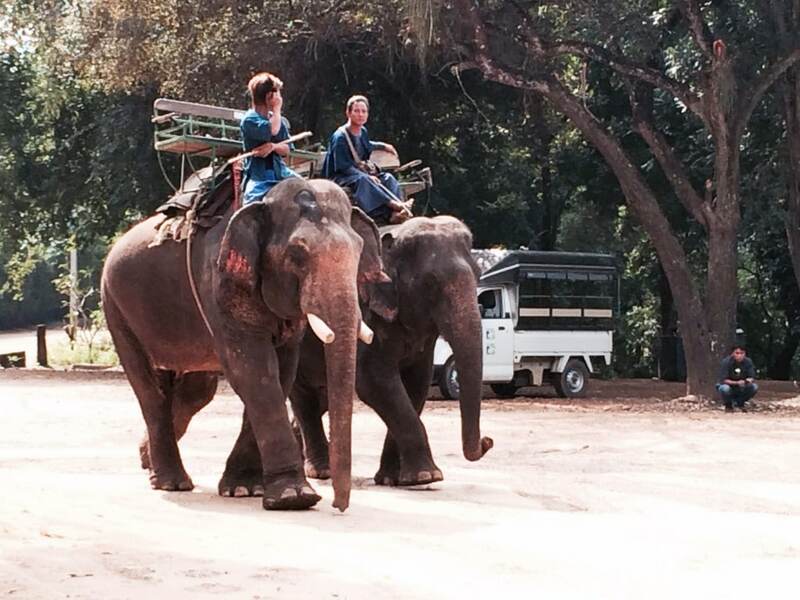 We pulled up to three baby elephants standing in the front on extremely short chains. They were very anxious and pacing in a circle, non stop. ElephantsWorld currently has a large group of American students spending a few days with us, and they joined us on this outing. Of course, like most tourists, they were excited to get the chance to play with baby elephants and they ran over. I made sure to point out the short chain, lack of food and the fact that wild baby elephants never leave their mothers (unless they are male and in that case they leave the herd at 14). These poor things were less than three years old. I’m not sure if you ever seen how much energy a baby elephant has, but they’re crazy. 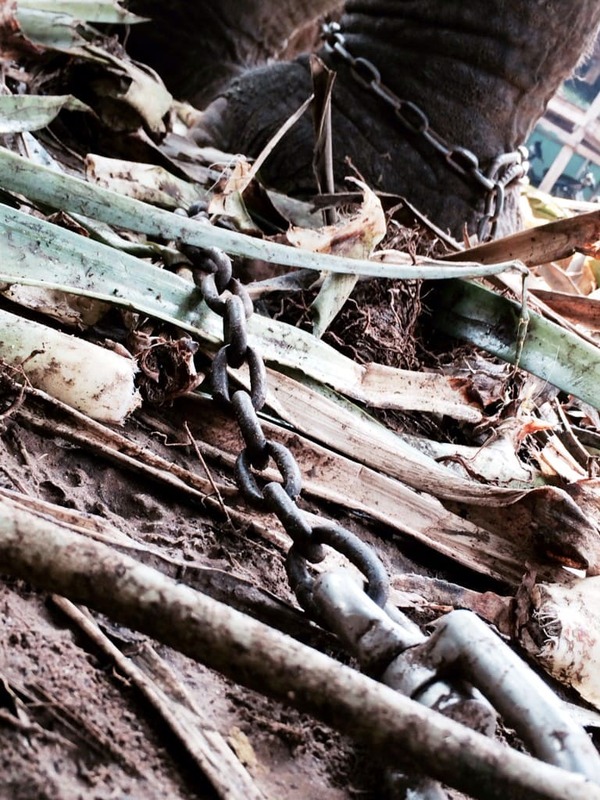 To constrain them to 2 feet of chain is disgustingly cruel and heartbreaking. 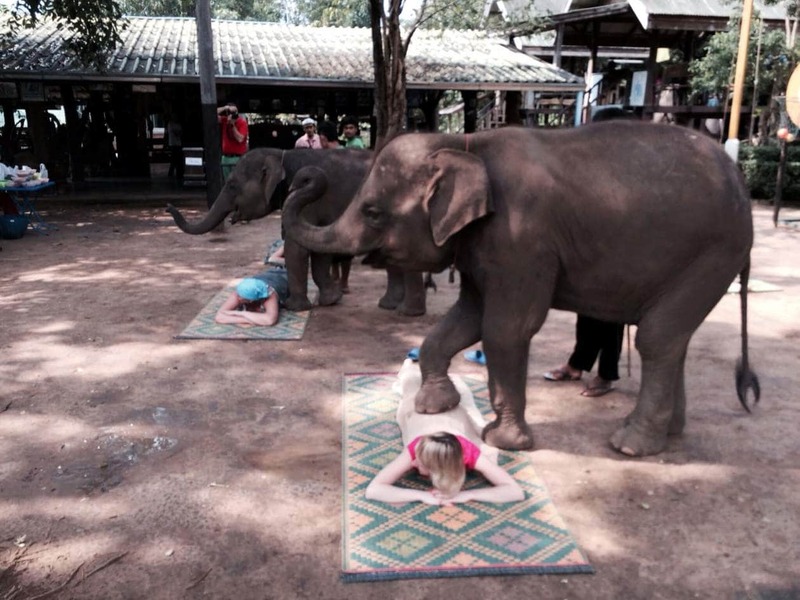 Another thing tourists don’t realize is that while elephants look strong, they can only support 220 pounds on their back, and the chairs used for trekking weigh 110 pounds alone! 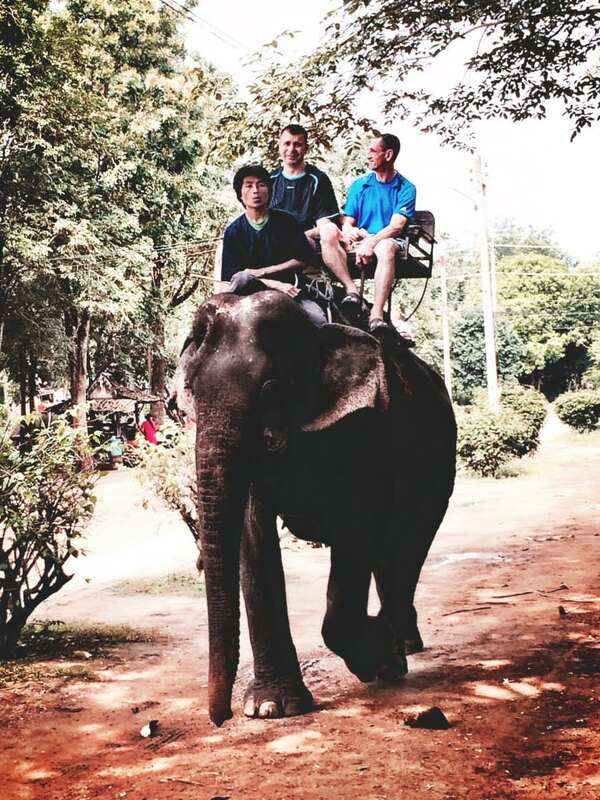 Add two people and a mahout for 10+ hours a day and it’s hell on earth for an elephant. In the wild, they eat 12-18 hours a day and can take in up to 600 pounds of food in 24 hours. Working elephants are lucky if they get a break in between rides, and since most camps own between 30-50 elephants, they do not get nearly enough food or water to remain healthy. 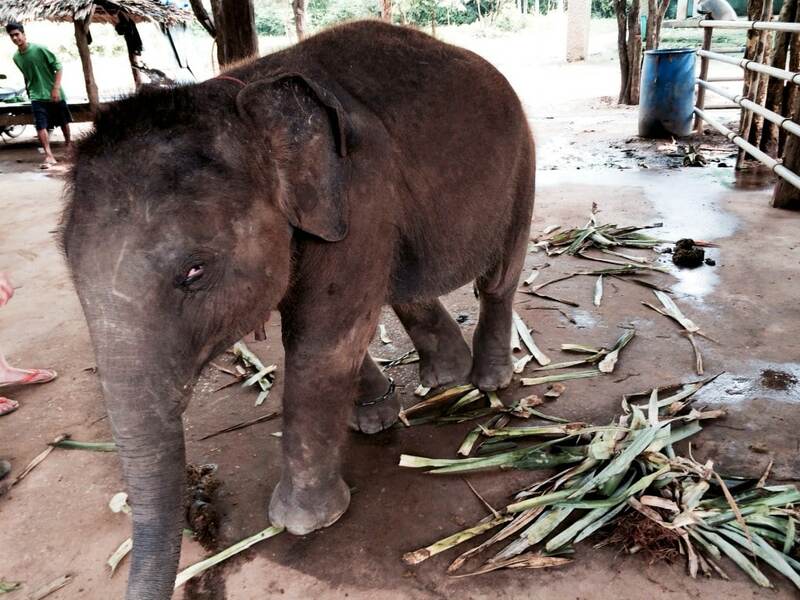 Songkran, came from trekking camps and she could barely stand up when she arrived. She was too weak to feed herself so that’s why we must still feed her by hand. I could see the students start looking at this camp with new eyes and many of them became pretty upset. 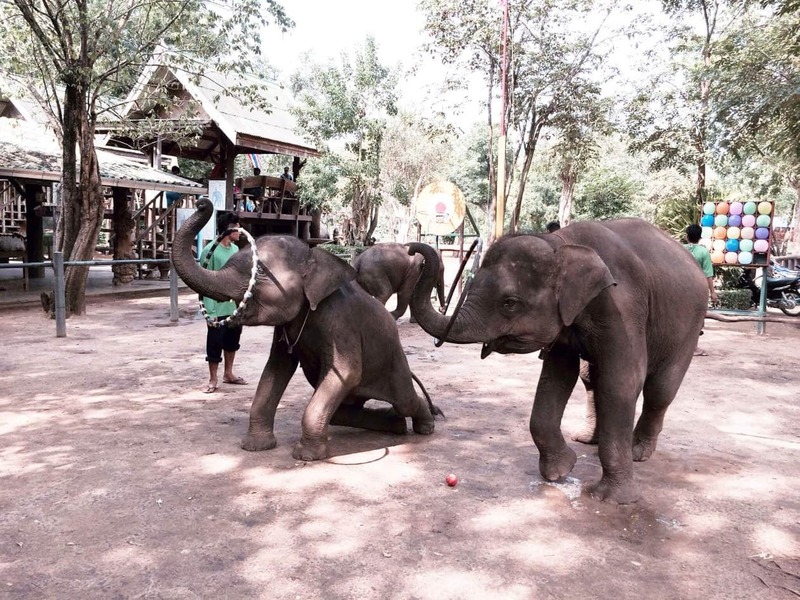 Every 30 minutes the show starts, and the babies are taken off their chain to perform tricks. The only time they are allowed to walk further than 2 ft all day. They were forced to throw darts, twirl hula hoops and give massages. After the show, tourists were allowed buy small baskets of bananas to feed to them. The only food they eat all day. Definitely not enough to sustain a growing elephant. Elephants are extremely intelligent but performing tricks, and giving rides is not natural. 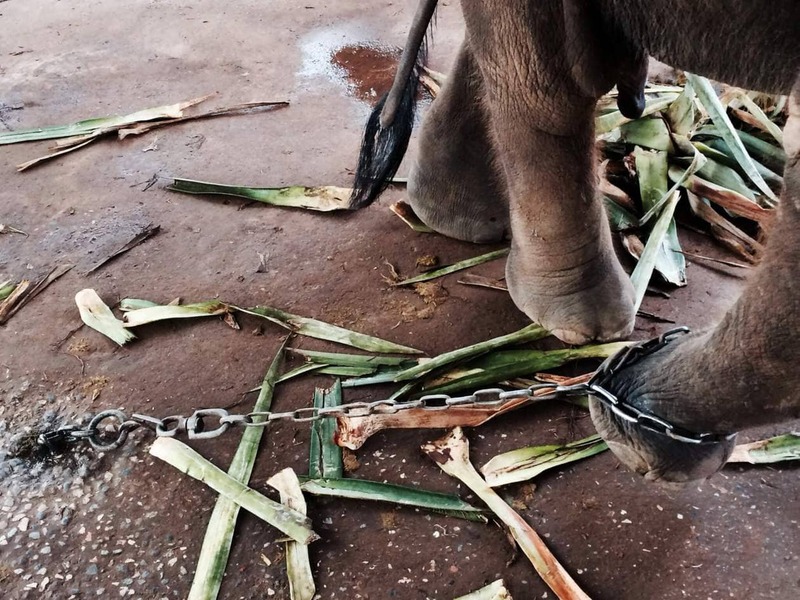 The training method in Thailand is called Phajaan or ” the crush.” As babies, elephants are beaten, starved and deprived of food until the mahout sucessfully break’s the animals spirit and it becomes submissive. Mahouts also carry a sharp hook which they use often to control their elephant. If you look closely, you will see open wounds, and scars. Trekking camps don’t hide these practices but most tourists have no idea, so they are oblivious to what’s right in front of them. It was so difficult to leave 30 elephants behind. The camp is sending one elephant over but we are not sure of the stipulations. It could be a donation, or they might ask for her back, once she is healthy again. This is one of Elephant World’s policies I do not agree with. On the ride home I talked with our guests about what they had seen and encouraged them to post it about and inform their friends. 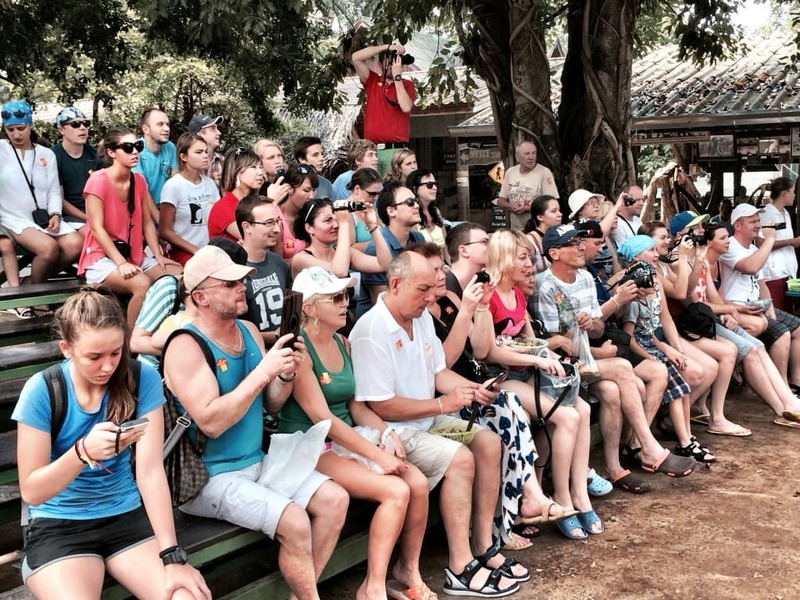 People really just don’t know and everyone wants a picture with an elephant when they go to Thailand. We often underestimate the power of our own influence. 12 of us witnessed the malnourished, stressed and abused elephants today and if we all tell 1 person, or our social media networks, the world will get out. If you know people that are traveling to Thailand please encourage them to visit sanctuaries and rescues, not trekking camps! *we did not buy a ticket to enter the camp or watch the show.